Sturdy Clear 0.188" (3/16") Acrylic with Smooth, Polished Edges. Great for Ballots/Comments, Contest Entries, Business Card Drops, etc. Don't Forget Pens, Card Holders, Etc. The BB10NL is a Clear Acrylic Non-Locking Comment or Suggestion Box. 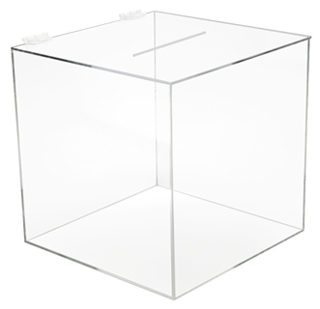 This Small Ballot or Comment Box Can Be Used for Contests, Voting, etc.. Hand Manufactured from Sturdy Clear Acrylic, This Ballot Box is Durable and is Built to Last.